The Bengal Warriors have taken the rough road to be where they are today. With consecutive finishes in the lower half of the table, the team finished season five with an all-time best - third place on the leaderboard. The team has put in long and hard hours of identifying and fine-tuning their strategy and skills. This improvement showed vividly in season five as the team took on the giants of the sports and left the arena with a win and the respect of the audiences. The UP Yoddha team made their debut last year and ended season five with a respectable fifth place on the leaderboard. It is these factors that make watching a UP Yoddha Vs Bengal Warriors match a thrilling experience. Bengal Warriors lead 2017 head-to-head against the UP Yoddhas and will be looking to maintain this streak. Both teams have made big changes to their lineups for season six and we delve into the discover the names that will make it to the highlights reel of the UP Yoddha vs Bengal Warriors match. UP Yoddha’s captain Rishank Devadiga is a budding talent in the sport and has been given charge to lead the young team in the PKL for season six. On the other hand, Bengal Warriors captain Surjeet Singh is a reputed defender and among the few PKL athletes with the highest 5s in the game. Jeeva Kumar holds incredible raiding skills and is among the best raiders in the PKL. Along with Devadiga, this unit of raiders will be key in turning the UP Yoddha vs Bengal Warriors result in their team’s favour. Korean raider Jang Kun Lee brings overseas expertise to the raiding department of the Bengal Warriors. Having scored the highest number of points among overseas players in PKL, he will be a talent to watch out for during UP Yoddha vs Bengal Warriors matches. The UP Yoddhas team is among the few teams who have defeated the behemoth Patna Pirates. Whereas, Bengal Warriors’ overall success record speaks for itself. Bengal Warrior’s leading point scorer in season 5, Maninder Singh’s imposing raiding skills can be expected to surprise the best of defenders during UP Yoddha vs Bengal warriors games. After giving his career-best performance in season 5 with 71 successful raids, Patna Pirates’ Deepak Narwal will be expected to deliver a similar performance in season 6 too. Team Bengal’s Ran Singh is a multi-skilled player with the ability to dominate all areas of the mat, making him a vital all-rounder for UP Yoddha vs Bengal Warriors matches. The Bengal Warriors team is built strong in all areas, the feisty raiders make for a good offence strategy and the strong defenders ensure points are not taken away easily. The UP Yoddhas, on the other hand, is a raiding unit that gets most of its points from raids but lacks the ability to put up a strong defence. Nevertheless, both teams will be working hard to improve their results and finish stronger than last year. 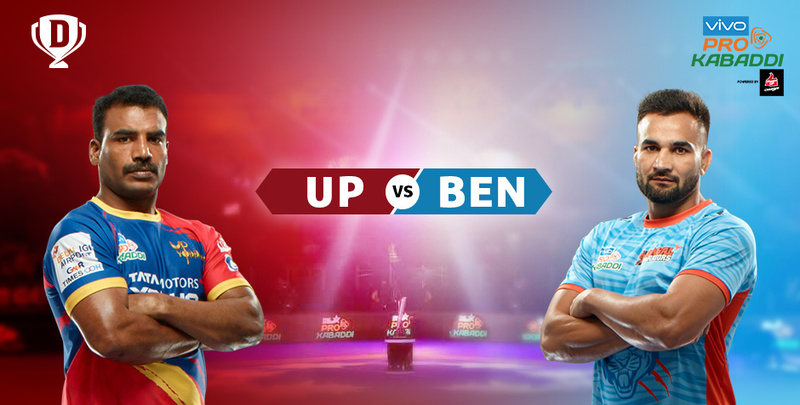 So, don’t forget to catch the excitement of UP Yoddha vs Bengal Warriors live this season. Enjoy an incredibly exciting sports strategy experience with Dream11. If you have the skill and the foresight to identify key players of the game, make your picks on Dream11 and get set to be rewarded. Train your team building skills with free contests, then tune up the difficulty by participating in the various contests for exciting matches like those of UP Yoddha vs Bengal Warriors. So, get started on the official website or log on the Dream11 mobile app today!